Some independent journalists and university professors in the United States who have appeared on RT television to criticize either runaway corruption on Wall Street or in Washington, have landed on two newly created blacklists. RT is a Russian state-financed news network formerly known as Russia Today. Its English-language RT America unit broadcasts from Washington, D.C.
A shadowy group called PropOrNot, that has not disclosed either its funders or its principals, has created a blacklist of 200 independent media web sites that it is calling tools of Russia. On the list are some of the most popular and widely read alternative media outlets like Naked Capitalism, Truthout and Truthdig, which regularly carry articles by some of the most knowledgeable and informed voices in America. Another popular site, CounterPunch, was originally on the list but has now been removed following what PropOrNot calls a “constructive conversation.” Reporter Craig Timberg of the Washington Post has come under withering criticism for amplifying the McCarthyite blacklist in a Thanksgiving Day article. Equally disturbing, 200 university and college professors have been placed on a new Professor Watchlist being operated by Turning Point USA, a right-wing nonprofit run by 23-year old Charlie Kirk who spoke this year at the Republican National Convention. Kirk has raised well over $1 million from conservatives to spread the “free markets/small government” mantra at high school and university campuses (never mind that Wall Street’s “free markets” are just as corrupt today as they were heading into the 2008 epic financial crash). In 2012, Kirk wrote an opinion piece for Breitbart News suggesting that Paul Krugman’s ideas should be replaced in high school classrooms by those of the Cato Institute – a nonprofit secretly owned in part by the Koch brothers for decades. (Such ideas will land one on the fast-track to big money from the right wing in America.) Steve Bannon, the former Executive Chairman of Breitbart News Network and anti-liberal propaganda filmmaker extraordinaire, has been named by Donald Trump as his Senior Counselor and Chief Strategist in the White House. 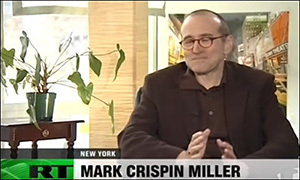 Yves Smith, the founder and widely respected writer at Naked Capitalism has appeared on RT television on several occasions. In the interview featured below from 2010, she was afforded the time to make her brilliantly cogent points on the systemic corruption on Wall Street that has yet to be remedied despite the greatest financial crash since the Great Depression. In 2011, Smith alerted her readers that she was going to be appearing on RT America, noting that she “seemed to be banned from US TV channels, but the flip side is this was a much more substantive conversation than you’d find on the usual suspects here.” Indeed, RT America has allowed independent journalists and professors adequate time to make detailed arguments against establishment group-think in America, something that is regularly lacking on corporate-controlled news media in the U.S. The above comments made by Smith, Roberts and Miller on RT television are completely factual and are views shared by tens of millions of fellow Americans. Rather than attempting to censor their well-founded arguments that America is dangerously headed in the wrong direction, perhaps we should get to work on the critical problems they are attempting to bring to the fore.